So you will see pinned at the top of the forum a new feature. 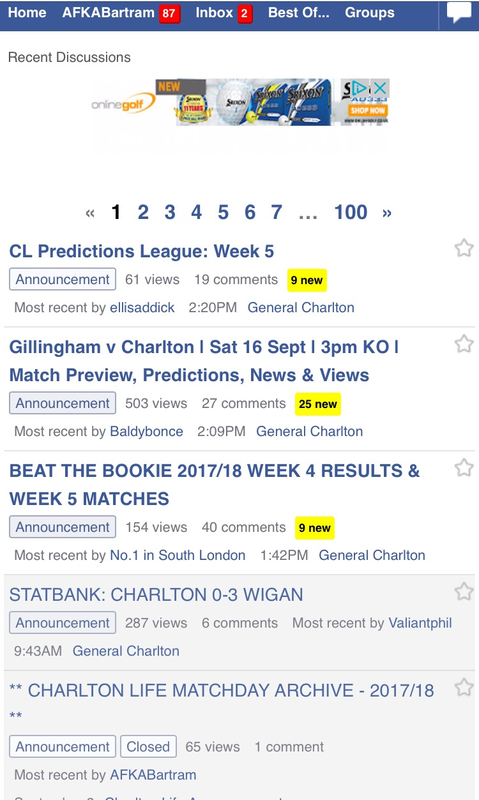 We've been working hard behind the scenes over the last few weeks to try and improve ways in which we can draw out the Charlton football aspects amidst the forum and one of these ideas is to create an easier search / connect aspect for all things related to fixtures. So we've put together what will hopefully prove a useful one-stop shop resource. A link will be provided against each fixture, and a specific page for that fixture has been created. In that will include the key facts from the game (players, crowd, scorers etc), a summary, key quotes, snapshot of Statbank marks and links to all the CL game related threads (preview, match thread, post match views, statbank). Each page will also link back to the main season links page. In time we will be expanding the archive to cover previous seasons. Hopefully this will provide a useful resource tool as time goes on. If anyone ever has any ideas on how we can improve our content and output through CL, please drop me an inbox, I'd be delighted to hear your views. ps. this has been wholly compiled during lunch breaks during the last few weeks, so there are bound to be mistakes. Any mistakes, duff links etc. please feel free to point out on this thread and I'll gratefully correct. Great idea. I can't see where it's pinned though? An online resource to look back at previous games is something I've thought think we were lacking for a while. A year or so ago I spent a while working on cafcarchive.com to try and fill the gap but it was very time consuming and my lack of web development skills made it difficult so I was never happy enough with it to really promote it. The fact that this incorporates the match threads and player ratings etc. is great. Will be great to look back on in a couple of years time. Link is working and this is an excellent idea. Cannot see where it is pinned though. In the sticky announcement bit. Do your announcements not show as below? Yep, I was also being thick. I can see it there. Thanks for everything you and Lookout and CrabApples and I know I'm forgetting someone do. It's hugely appreciated.